This entry was posted in DT Proxy 2018 on April 4, 2018 by junkabilly. (Tommy) We are coming down to the wire race fans! The competition at the 2nd Annual Dragon’s Tail Road Rally has been fierce! Each one of these teams have come to race. (Smokey) The lead has changed hands several times. Top runners have fallen to the bottom and mid pack contenders have clawed their way up through the competition. Just seconds and fractions of seconds separating each. Aurora how does the field look from above? (Aurora) We have a good view of the front runners now. Jerry Titus in the purple Cheetah of Grand Sport Racing has moved up to join the big boys and there is a four way combat going on. It’s almost too close to call. One tiny slip up will cost someone a spot on the podium. (Tommy) Almost on cue, After clawing and biting his way up from the 9 spot to at one time the number one spot, Dano mis steers the King Pin curve and allows the Cheetah into the top three. (Smokey) You can’t be too upset if you’re the Nonesuch Team. Dano ran a good race for them and that Javelin was impressive and seemed to be made for this track. He really cut through the herd to get up front. It just wasn’t meant to be today. (Aurora) The Scud Missile makes a strong move on Girlieman in the V dub Ghia but the Girlieman Brothers manage to hold off the Asconi attack. (Tommy) McLovin is still trying to hold off the V dub combo of Herbie and The Junkabilly Buggy to complete the top 5. They are right on his tail. (Smokey) Approaching the finish line, McLovin shouted, “Break Yourself Fool! and pumped his brakes. The driver of the blue Manx Dune buggy fell for the ruse and stopped suddenly, but Herbie’s quick reflexes averted the trap and went around. The Rocket City VW Beetle claims 5th! (Tommy) Followed by McLovin in the Mustang and Carl Scarborough in the Buggy. (Smokey) Bubba turns in a good last effort, but his struggles with the new car in the middle of the race killed his attempt to defend his crown. (Aurora) Max Creek continued to improve and his Ghia Jolene seemed to have more power this time around and handled the course well. It was hard for him to get a decent consistent run. (Smokey) The Strummer Racing Beetle limps in. It seems to have lost some power. Could be a valve problem. (Tommy) Here comes the lavender dart from King Racing. Ted E. Baer struggled the entire race with tire issues. The car seemed to have plenty of power and it’s wide stance handled the twists well despite its higher profile. (Smokey) And what can we say about Guido DaBritt in the Jagarri? He was all style and class! Well Fans, that concludes the 2nd Annual Dragon’s Tail Road Rally. At this time we’d like to Thank all of this year’s Sponsors for their show of support. Because of them, the racers will be richly rewarded for their efforts! helped in providing a bigger audience and greatly added to our fan base. Thanks to the judges of the concourse and to the 109 folks that cast their vote for the “People’s Choice Award”. And finally, on behalf of all of us here at The 2nd Annual Dragon’s Tail Road Rally We Thank the Fans. We really appreciate you tuning in to follow the race!!! This entry was posted in DT Proxy 2016 on March 5, 2016 by junkabilly. (Tommy) Race Fans, we have a real battle going on at the 2nd Annual Dragon’s Tail Road Rally!!! We are a little over the halfway mark and no one is ready to roll over yet. We knew this was going to be a combative challenge before we reached the halfway hump and we have not been disappointed. (Smokey) Hump is right Tommy. Before we left for the last commercial break we talked about the various trouble spots on the course and the number one technical challenge is without a doubt the Backbone, a series of humps and twists that are starting to take its toll on the drivers and their cars. Most particularly is the low sitting ’64 Ferrari 330 P4 of Scuderia Ferrari Team. Driver Asconi struggles to keep his feet on the pedals. (Tommy) You would think that a team that has excelled at a rough course like Sebring wouldn’t have issues with the Backbone. (Smokey) A rough course is one thing, but these humps are acting like a launch pad for the “Scud Missile”. Team owner, Tom Bowman was asked what he thought about it and he said, “Humps are good… on a SuperCross track”. (Aurora) Clearly he is not amused. Despite the beating to the Ferrari, Asconi manages to stay with the front runners. (Tommy) The current leader if you can really call him that is Franz Girlieman in the custom Ghia, but these cars are running so close. The lead keeps going back and forth. It’s hard to tell who’s the front runner. (Smokey) Well, to the guys in the stands wearing the “I’m with Girlieman” t- shirts, it is very clear who the leader is! And you can’t rule out Jerry Titus in the purple Cheetah. As long as he can keep the engine from overheating which Cheetahs are prone to do, he could continue to impress us with his skills. (Tommy) There are a lot of steady strong running cars mid pack that are also fighting for a spot in the top five. (Aurora) McLovin is feeling some heat from the Herbie Love Bug. The red Mustang has picked up some speed as he tries to get away from the Rocket City Beetle and the Junkabilly Dune Buggy is not far behind. (Smokey) Don’t put a fork in Bubba just yet. He’s not done as he turns in his best performance so far in the purple Camaro! (Tommy) The fuel treatment is finally kicking in for Max Creek in the white ’65 Ghia named Jolene. It’s his best performance too. (Smokey) Von Wolfenstein puts the ’65 Beetle for Strummer Racing into gear trying to get back to the middle of the pack. (Tommy) Ted E. Baer had gained a little speed before the break but now he seems to be settling back down to a slower pace. Being the nice guy that he is, he found time to stop for a fan photo. (Smokey) Guido DaBritt in the Jaggarri is enjoying his Sunday stroll through the countryside. (Tommy) We are in the home stretch folks!!! Let’s look at the board before we take a short break. This entry was posted in DT Proxy 2016 on March 1, 2016 by junkabilly. (Tommy) Welcome Back Race Fans! We have had an exciting first two legs of the 2nd Annual Dragon’s Tail Road Rally. When we started the qualifying runs we knew that we were going to have a much more even and faster race than last year’s with just fractions of a second separating each car. (Smokey) That’s right Tommy, compared to last year, these cars are all very equally matched, the ones trailing are only doing so because their tires are not liking the road surface or they’ve had a few unlucky episodes. There is plenty of speed and they all seem to be handling the twists very well. (Tommy) Smokey some of the drivers seem to be taming the Backbone better than others. What is the key there? (Smokey) Right again Tommy. For those of you unfamiliar with the Backbone, it is a winding twisting part of the course made up of a series of little hills or humps. If the driver is not careful it is easy to become air born and your landing is not always good to you. Tommy, the keys to the Backbone are momentum, rhythm and coast. Get enough speed, lay off of the gas, put in the clutch and float over the humps. (Tommy) Aurora has a view of a few of the cars that have really mastered that technique. Thanks Aurora for that shot. What is another problematic spot on this course? (Smokey) Well Tommy, they don’t call this the Dragon’s Tail for nothing and the Backbone to the tail that sort of whips you around to the main drag is certainly the most challenging, but another trouble spot is up at Castle Mountain and then that sudden drop down to King Pin Curve. There’s a blind spot there and if you are not careful, when you hop down to the foot hills it’s easy to find yourself in a problematic situation. (Tommy) Thanks Smokey. Now let’s check out some more action. Before the last commercial break we saw the Nonesuch Racing Javelin and the Girlieman Ghia steal the lead from Asconi in the maroon Ferrari while he had some issues with his shoes. He seems to have scraped off whatever was troubling him and is now trying to get that lead back. The three leaders are now approaching that tricky area of the drop down from the mountains that Smokey was talking about. Roberto Asconi makes a risky move on the Javelin. Dano tries to counter! They get tangled up in the foothills and Girlieman steers clear and passes them both! Wow! A third lead change! What did we tell you folks?!? These cars are evenly match. It is a battle out there. (Aurora) Ah, Tommy. Smokey. It doesn’t look like we are finished yet. That purple Cheetah from Grand Sport Racing has managed to put some distance between it and the red Cornhusker Mustang and now seems to be setting its sights on the big three up front! (Smokey) Awesome. Yes, the Cheetah has already shown its agility in that crazy maneuver it pulled in order to pass the Mustang. Jerry Titus is not ready to go home yet and he is planning to bring it on. I don’t know if the leading three have been looking in their rear view mirrors but if they did, they would see a blur of purple. (Tommy) McLovin in the Cornhusker Racing Mustang has found a new threat. The VW club made up of Herbie from Rocket City Racing and the Junkabilly Dune Buggy are in hot pursuit. (Smoke) Like that tenacious female “Jolene” the South Shore Racing Ghia. She’s wanting to join up with her V dub brethren and that purple Camaro is the only thing standing in her way. (Tommy) Ted E. Baer in the purple Dart for King Racing turns in his best performance yet. Maybe his tires have dried out. The Strummer Racing VW Beetle continues to climb back after it’s unfortunate foggy mountain glass experience. This entry was posted in DT Proxy 2016 on February 28, 2016 by junkabilly. (Tommy) Welcome back to 2nd Annual Dragon’s Tail Road Rally! If you are just joining us, there is a little break in the competition as we wait for the sun to dry out the track. Race Officials finally put a halt to the action when the rain started coming down making road conditions unsafe. (Smokey) Tommy the course might be quiet for the time being, but there is plenty of activity in the pits. Officials gave the thumbs up to racing teams and will allow them to work on their cars. (Tommy) That’s good Smokey. The poor weather was really starting to influence the performance. It will be interesting to see how each team adapts. (Smokey) Team Karmann Ghia came well equipped to race. The Girlieman brothers have decided to swap out the wet tires for some fresh rubber. Dano was pleased with how his Javelin was performing so he is just resting up for the battle ahead. He was staring daggers at the driver of the maroon Ferrari trying to psych out Roberto Asconi. The driver for Team Scuderia Ferrari didn’t seem to be bothered by it. He was last seen walking off towards the Burgerjoint in search of some cornetto… Interesting. As he walked past the grandstands a chant broke out “Scud, Scud, Scud, Scud”. (Smokey) It took me a while too. It’s short for Scuderia, as in Scuderia Ferrari. The crowd has taken to referring to his car as “The Scud Missile”. (Tommy) Ah, I see. Is he the crowd favorite? (Smokey) We did take some time and poll the crowd and there is a large camp that is cheering for him, but honestly there seems to be a lot of favorites and at this point it could be anybody’s race and anything could happen. Look at what happened to the Strummer Racing Team for instance. They started out in the top 5 and dropped considerably because of the foggy windshield. Hopefully they were able to reattach the heater hoses to get some of the hot air off of the engine up to the front glass. There are also some reports that Von Wolfenstein had stepped in something in the Burgerjoint parking lot and his shoes were sticky. (Tommy) When it rains, it pours… What was the commotion in the pits around McLovin from Cornhusker Racing? 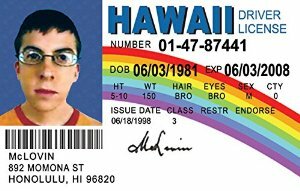 (Smokey) The officials were questioning the authenticity of his driver’s license of all things, but he was able to convince them that he was indeed a 25 yr old organ donor from Hawaii as his Driver’s license suggests. (Tommy) Glad we got that cleared up. (Aurora) Excuse me Smokey, speaking of clearing up… It looks like the weather is starting to clear and officials have given a 10 minute warning. Looks like there is some scrambling going on in the pits as racers have to get their cars back in order. Roberto Asconi nearly fell down running back from the restaurant. He is scheduled first to go out in the “Scud Missile” Ferrari. (Smokey) Yes, The drivers are getting geared up and the race marshals are releasing the cars in the order that they came in before the rain delay. There’s the green flag! (Tommy) Looks like the course may still be a little wet in areas. All the cars are now out. (Aurora) The maroon Ferrari seems to be slowing some in t he straights. (Smokey) Yes, Driver Roberto Asconi keeps looking down at his shoes. Perhaps he stepped in something in the parking lot too, sticky shoes. (Tommy) Dano in the Javelin makes a big move before the turn to Drawbridge Road with the Girlieman Ghia drafting close behind. WOW! Both make a clean pass of the Ferrari! (Aurora) There’s a serious battle going on in the hills between McLovin in the red Mustang and Jerry Titus in the purple Cheetah. McLovin is trying to hold the Cheetah off. They are in the s curves, Titus fakes left and goes right. He ignores the curves and drives straight, leaving the Mustang behind! (Tommy) Great driving! The shortest distance between points A and B is a straight line and Titus found it! (Smokey) Bubba is trying awfully hard to get to the front but found a puddle and slid into the trees. Help is on the scene but the ground is pretty soft. Herbie and Scarborough in the dune buggy were going to stop to lend a hand but the marshals waved them on. (Aurora) Max Creek has Jolene running better but there still might be some water in the fuel lines. (Tommy) Ted E. Baer in the Dodge Dart of King Racing is having a fun time hydroplaning. Those tires must be really wet. Strummer Racing’s VW Bug gets by the Jaggarri because Guido DaBritt was too busy checking out the wet T-shirt contest that just broke out in the stands. On that note, we’ll take a break for a word from our sponsors. This entry was posted in DT Proxy 2016 on February 27, 2016 by junkabilly. (Tommy) We’re back race fans! After an exciting day of qualifying runs, cars are getting ready to go out for the 2nd Annual Dragon’s Tail Road Rally. Smokey, after all the times were collected the car from Scuderia Ferrari took the top spot. (Smokey) That’s right Tommy. Owner Tom Bowman must be pleased with how Driver Roberto Asconi put the Ferrari through its paces. (Tommy) It was a commanding performance that has left a few drivers discouraged. (Smokey) True Tommy, there were some low hanging heads in the drivers’ clubhouse this morning but this is the Dragon’s Tail people, anything can happen! The maroon Ferrari is off! (Aurora) That car is moving effortlessly through the hills. A good steady pace. (Smokey) Next out of the box is Franz Girlieman in the #31 Ghia. Hans, brother and teammate forced to park his car is now riding shotgun for encouragement. They’re off! Another fine running car. Will they be able to catch the leader? (Aurora) Guys, the clouds are starting to move in. Rain may hinder the drivers. (Tommy) We will continue the race until officials decide it is no longer safe. Drivers will need to exercise caution. (Smokey) We had some really close qualifying times so there will be plenty of door to door racing as the cars are sent out. The candy apple red mustang from Cornhusker Racing goes out followed by the Grand Sport Racing Cheetah. These two are really battling. (Tommy) The VW bug from Strummer Racing leaves the grid. And the top five are on the course as the rain comes down. Racing officials are waving the next cars forward. (Smokey) Returning champ Bubba in the metal flake Camaro shoots out then realizes the roads are slippery. (Aurora) The VW Beetle from Strummer Racing is really having a rough go of it. Looks like his windshield is fogging up and He had to roll the window down to see. Rick Von Wolfenstein is weaving all over the road. After the stellar performance at the qualifying runs, Owner Harlan Welch-Scarboro will be disappointed. (Tommy) Fortunately, the next Beetle doesn’t have to worry about driver issues… Herbie from Rocket City Racing handles the rain without problem and moves on. (Smokey) Driver Carl Scarborough Jr in the convertible Manx Dune Buggy was seen squirting some WD-40 on his goggles to help bead off the rain and manages to hang with Herbie. (Tommy) Next out is the AMC Javelin for Nonesuch Racing. (Smokey) This morning at breakfast owner/driver Dano had a pensive determined look on his face. After a strong second place finish last year, he was not pleased with his qualifying run. He’s having a better run in the rain. (Aurora) Strummer Racing’s V dub continues to weave and is now causing some trouble as the other cars are trying to pass… Wow! the Camaro, Herbie and Manx buggy were hanging back being cautious around the weaving bug, and the Javelin came out of nowhere and made a clean pass on the outside! (Smokey) Jolene the white VW Ghia with orange stripe from South Shore Racing leaves the line but seems to have gotten some water in the tank. Bursts of power then sluggish performance. Tommy, the rain is starting to play a big part in the performance out there. I look for the officials to call it soon. (Tommy) Yes, road conditions are starting to deteriorate. The Dodge Dart from King Racing takes off and has some trouble with slippery tires but driver Ted E. Baer manages to get the Grape Deuce around the Strummer Racing Beetle. L ast out goes the Jagarri from Outlaw Hippy Racing. Driver Guido Da Britt doesn’t seem to mind the rain too much and manages to also go around the struggling bug. (Aurora) Visibility is getting bad up here and I’m not sure I’m seeing correctly but it looked like while Girlieman in the #31 Ghia was busy holding off the red Mustang and purple Cheetah, the Nonesuch Javelin flew by them. The Javelin seems to have the right tires in the rain! (Smokey) Well, just as Dano was setting his sights on the Ferrari the officials waved the red flag. Drivers are instructed to return to the pits until conditions improve. (Tommy) Before we break for some words from our sponsors, Let’s look at the board and see where things stand. This entry was posted in DT Proxy 2016 on February 24, 2016 by junkabilly. These 12 were chosen from a field of 19 cars as concours d’elegance finalists. Cast your vote for your favorite! This entry was posted in DT Proxy 2016 on February 22, 2016 by junkabilly.